No time. No privacy. No quiet. As a meditation instructor, this is what I most frequently hear from parents who want or even desperately need to practice meditation – but can’t. Actually, you can. The key is being flexible about your expectations of yourself and about forms of practice. There are many techniques that progressively quiet the mind and don’t take much time or privacy at all. Meditation can be integrated into your daily activities. The benefits transcend being more centered and calm. Meditation restores a sense of self and gives the experience of an unchanging identity, the loss of which underlies some of the deepest stresses of parenting. Remembering who you are and connecting to your core each day can create the tipping point to transform parental stress into joy and fulfillment. Sitting: When you can take the time for deep renewal. This basic but powerful practice is for anyone who can find twenty minutes of quiet time each day. Sit comfortably with your eyes closed and your spine straight. Focus on your inhalation and exhalation, or silently repeat the mantra, so hum. When your mind wanders, return to your breath or to your mantra. Twenty to thirty minutes of this simple meditation technique can provide a depth of stress relief, rest and renewal that usually requires several hours of sleep. Remember that taking this time for yourself – even if it is your secret – is not something to feel guilty about. Your increased compassion, patience and stamina will benefit your entire family. 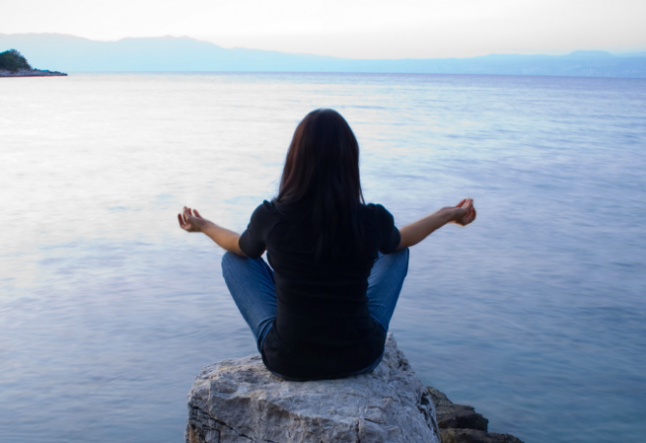 Breathing: When you are tense, confused , or feel physically stressed. Breathing can be done anywhere, anytime, as needed. In three or four minutes, you can take a series of authentically revitalizing, yogic breaths. Ujjayi breathing, which is at the very heart of a yoga practice, settles the mind. The inhalation is deep, causing the stomach and then the chest to expand, until the air is pulled through the back of the throat. With the exhalation, the breath is slowly released from the throat area, the chest, and finally the stomach. Ten repetitions can create a feeling of energetic calm, clear the mind and help you to lighten up. A pranayama class gives many specific breathing techniques to create energy, soothe the nerves, adjust body temperature, or provide deep emotional release at will. Mindfulness: When you are too busy to pause. Getting ready for work, washing the dishes, talking to your child and preparing meals may leave you without the time to meditate – or these activities can become the heart of your practice. Remain fully present by focusing completely on what you are doing in the moment. Much stress, resentment, and guilt come from thinking too much about everything you have to or want to do, and can’t. Slow the mind down to focus on what you are actually doing or who you are talking to, and let go of all extraneous thoughts. Say to yourself, “OK, right now, I’m packing lunches for the baseball game.” Then, just pack lunches. You’ll become more efficient and less stressed, forgetful and confused. Recent research shows that some memory loss is caused by too much multi-tasking. Mindfulness practice can be integrated into daily routines to cultivate a clear and peaceful state of mind. As yogis, you know the beauty of balasana, or Child’s Pose. This forward bend is a rest pose that soothes the nervous system and turns the mind inward. Allow yourself to simply curl up and feel the comfort and reassurance that this pose offers. It induces that cozy, blissful feeling of safety that you have when you don’t want to get out of bed in the morning. After a few minutes in child’s pose, you may notice that you just want to sit for a moment and breathe, that you are rising slowly and doing your next task mindfully. It’s so easy, you do it again the next day. And, right there, you have a practice.